A Coriolis mass flow meter consists of a U-shaped tube that deflects or vibrates as the fluid flows through it. The operation of this type of mass flow meter is based on the conservation of angular momentum as it applies to the Coriolis acceleration of a fluid. Coriolis acceleration is that tangential force experienced when one walks radially outward on a rotating platform. The force is only experienced when one changes position in relation to the center of rotation. As fluid enters the U-shaped tube, it is forced to take on the vertical movement of the vibrating tube. When the tube is moving upward, the fluid flowing into the meter resists being forced up by pushing down on the tube. Having been forced upward, the fluid flowing out of the meter resists having its vertical motion decreased by pushing up on the tube. The two opposing forces on the tube cause it to twist. The amount of twist is directly proportional to the mass rate of fluid flowing through the tube. 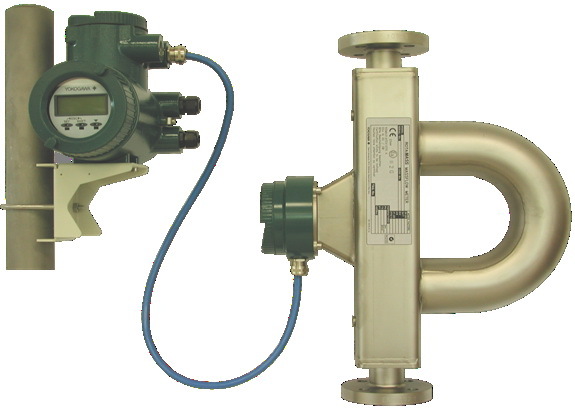 A mass flow meter consists of a vibrating U-shaped tube in which the Coriolis acceleration is created and measured. In place of the rotational motion described above, the inlet and outlet of the tube are held fixed while the tube is vibrated sinusoidally about an axis formed between the inlet and outlet, typically by a magnetic device located in the bend. In most devices, magnetic sensors located on each side of the flow tube measure the respective velocities, which change as the tube twists. Newer models have two U-shaped tubes to measure fluid flow. Coriolis mass flow meters are generally used in the following liquid applications: harsh chemicals, low to medium viscosity, foods, slurries, and blending systems. Gas applications are somewhat limited since the density of low-pressure gases is usually too low to accurately operate the flow meter. Typically, thin walled tubes are used for gas applications. However, when applicable, the mass flow meter eliminates the need for pressure and temperature compensation and the hardware necessary to implement these functions. For more information about Coriolis mass flow meters, contact Power Specialties by visiting https://powerspecialties.com or by calling (816) 353-6550.